Biotin is available from various food sources, and is also synthesized by intestinal bacteria; hence dietary deficiency is uncommon. Chronic alcoholics and those on long-term anticonvulsants could develop biotin deficiency because of impaired intestinal uptake of the vitamin. Avidin, a protein found in egg whites, binds strongly to biotin, impairing the absorption of the vitamin, leading to severe biotin deficiency in those who consume excessive amounts of raw eggs. Patients affected by certain genetic defects affecting biotin metabolism present with a clinical picture of biotin deficiency. The clinical presentation of biotin deficiency involves abnormalities of the hair, skin, nails and the central nervous system. Seizures, hypotonia, ataxia, optic atrophy, visual deficits, sensorineural deafness and developmental delay (in children) are some of the neurological manifestations. Metabolic abnormalities may include organic aciduria, lactic acidosis and hyperammonemia. Supplementation with biotin leads to clinical improvement in most cases. In the early 1900s, researchers found that the inclusion of large amounts of raw egg whites in diets in rats produced symptoms of toxicity. In 1926, Boas referred to these symptoms of toxicity as egg-white injury syndrome. The major findings included severe dermatitis, loss of hair, and lack of muscular coordination. Boas also noted that yeast, liver, and several other foodstuffs contained a substance that protected rats from egg-white injury syndrome. A search for this protective factor led to the discovery in 1936 of biotin. The biochemical basis for egg-white injury syndrome was quickly elucidated when raw egg whites were found to contain the glycoprotein avidin, which has a remarkable affinity for biotin. The biotin-avidin bond is essentially irreversible; as a result, biotin is not liberated from food, and the biotin-avidin complex is lost in the feces. The final step in solving the mystery of egg-white injury syndrome was the demonstration that the syndrome could be prevented by heating the egg whites, a process that denatures avidin and destroys its affinity for biotin. Biotin is a bicyclic molecule composed of a ureido ring fused with a tetrahydrothiophene ring. The ureido ring is involved in the high affinity binding of biotin to avidin, a glycoprotein found in egg-white. A valeric acid substituent is attached to one of the 2 carbon atoms of the tetrahydrothiophene ring. Through this carboxyl group, biotin is linked covalently to the β-amino group of lysine in 5 carboxylases that play critical roles in intermediary metabolism. 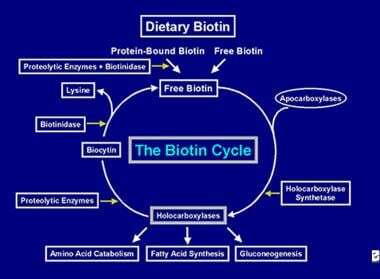 Biotin functions as a coenzyme in carboxylation reactions involving lipid, glucose and amino acid metabolism. There are 5 biotin-dependent carboxylases each of which exists as an inactive apoform. The enzyme holocarboxylase synthetase (HCLS ) catalyzes the addition of biotin (biotinylation) to the inactive apoform, which leads to the formation of the active carboxylase. In all 5 carboxylases, biotin functions as a coenzyme or prosthetic group that serves as a carrier for CO2 in a multistep reaction. Pyruvate carboxylase (PC) catalyzes the formation of oxaloacetate from pyruvate, a step important in the TCA cycle, gluconeogenesis and lipogenesis; lack of this function can lead to hypoglycemia, ketosis, and lactic acidosis. Propionyl-CoA carboxylase (PCC) catalyzes the conversion of propionyl CoA to methylmalonyl CoA, which in turn isomerizes to succinyl CoA, and enters the TCA (Kreb's) cycle. PCC is important in the metabolism of odd-chain fatty acids, and the amino acids isoleucine, valine, methionine, and threonine. Lack of this enzyme function can lead to propionic acidemia. Levels of PCC in lymphocytes is a sensitive indicator of biotin status. 3-Methylcrotonoyl-CoA carboxylase (MCC) is involved in the catabolism of the branched-chain amino acid, leucine. Lack of biotin can lead to shunting of leucine catabolism products into an alternative catabolic pathway leading to the production of 3-hydoxyisovaleric acid which is then excreted in the urine. Acetyl-CoA carboxylase I (ACC I) catalyzes the conversion of acetyl CoA to malonyl CoA, in the cytosol, a step important in lipid synthesis. Acetyl-CoA carboxylase II (ACC II), catalyzes an identical reaction in the mitochondria; the resultant malonyl CoA plays a regulatory role in fatty acid oxidation. ACC I is a cytosolic enzyme; the remaining carboxylases are found in the mitochondria. Clinical manifestations of biotin deficiency can also occur as a result of genetic disorders causing a deficiency of the enzyme holocarboxylase synthetase or deficiencies of the individual carboxylase enzymes. Studies suggest a role for biotin in antibody production, macrophage function, differentiation of T and B lymphocytes, as well the normal function of natural killer cells. Recurrent infections, especially fungal are common in patients with biotin deficiency. Ingested biotin is present in free and protein-bound forms. Protein-bound forms are digested by gastrointestinal proteases and peptidases to form biocytin and biotin-oligopeptides. Free biotin is released from biocytin and biotin-oligopeptides by the action of intestinal biotinidase. Free biotin is then absorbed in the small intestine via a Na+ dependent, carrier-mediated mechanism, which also transports two other nutrients, pantothenic acid and lipoate and hence is known as the sodium-dependent multivitamin transporter (SMVT). The human SMVT gene is located on chromosome 2p23. SMVT activity is regulated by biotin levels; with it being up-regulated in biotin deficiency and down-regulated with biotin over-supplementation. Bacterially synthesized biotin is present in the unbound form and is absorbed in the large intestine by a similar carrier-mediated mechanism. The combined daily output of biotin in the urine and stool exceeds the dietary intake of biotin, suggesting the important role played by intestinal flora as a source of biotin. Once absorbed, biotin becomes available for various biotinylation processes. Biotin binds to each of the 5 apocarboxylases to form the corresponding holocarboxylase (see the image below) via the action of the enzyme holocarboxylase synthetase. The biotin molecule is bound to the protein by a peptide bond to an e-amino group of an apocarboxylase to form a holocarboxylase. 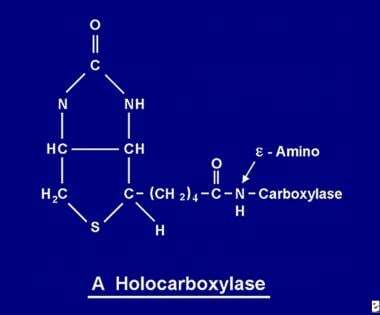 After the holocarboxylase enzyme has performed several carboxylations it is captured by cellular lysosomes. In the lysosomes, various proteolytic enzymes degrade the holocarboxylase to form biocytin, which, in turn, is hydrolyzed by the enzyme biotinidase to form biotin and lysine. Free biotin is then available for insertion into an apocarboxylase to form a new holocarboxylase molecule. This recycling process is not 100% efficient. As a result, small amounts of free biotin (and some biocytin) escape the cycle and are lost in the feces and urine. For this reason, biotin must be supplied to the intestine, to replenish the biotin lost from the body. The steps involved in the recycling of biotin- its entry into the gut, its absorption, its incorporation into holocarboxylases, which in turn are broken down to liberate free biotin constitute the biotin cycle and is depicted in the image below. The enzyme biotinidase is essential for biotin recycling and individuals with biotinidase deficiency will therefore present with signs and symptoms of biotin deficiency. Depiction of the flow of biotin in the biotin cycle. Short gut syndrome and inflammatory bowel disease: Individuals with short bowel syndrome and inflammatory bowel disease are also at risk of biotin deficiency as a result of intestinal malabsorption of biotin. Certain inborn errors of biotin metabolism may also lead to the manifestation of biotin deficiency. Holocarboxylase Synthetase (HCLS) Deficiency is also an autosomal recessive disorder and can be diagnosed prenatally. As discussed earlier, the enzyme HCLS is required for the biotinylation of the apocarboxylase enzymes into the active holocarboxylase forms; therefore deficiency leads to multiple carboxylase deficiency. Infants with this disorder present in the first few months of life with acidosis, hyperammonemia, hypotonia, seizures and developmental delay. Mutations in the HCLS gene cause HCLS deficiency. Rarely, isolated deficiencies of each of the five individual biotin-dependent carboxylases may also occur. Regardless of the etiology of biotin deficiency, clinical manifestations are similar. However, the age of onset, rates of symptom development and the sequence in which symptoms appear can greatly differ. All of the mechanisms responsible for the development of the manifestations have not been established. As mentioned previously, dietary deficiency of biotin is uncommon. Worldwide the incidence of profound biotinidase deficiency is estimated to be 1 in 137,401; the incidence of partial biotinidase deficiency, 1 in 109,921 and the overall incidence, 1 in 61,067. In populations with high rates of consanguinity (e.g., Saudi Arabia, Turkey) the incidence is higher. Neto et al noted that the estimated incidence of biotinidase deficiency in Brazil is about 1 case per 9,000 population. In the US the incidence is reported to be higher in Hispanics and lower in African Americans. In the general population, 1 in 120 is a carrier. The incidence of holocarboxylase synthetase deficiency is estimated to be 1 in 87,000. Biotin deficiency can occur in individuals of any race; however, as mentioned above genetic disorders affecting biotin metabolism may affect certain races and ethnic groups disproportionately. Biotin deficiency occurs with equal frequency in both sexes. Signs and symptoms of biotin deficiency can develop in persons of any age. Patients at risk of dietary deficiency of biotin (chronic alcoholics, those who are pregnant or lactating, those consuming excessive egg whites, those on chronic antibiotics or anticonvulsants) should be appropriately counseled and biotin supplements offered if appropriate. Genetic counseling should be offered when the cause is a genetic disorder, such as biotinidase deficiency or holocarboxylase synthetase deficiency, both of which are inherited in an autosomal recessive manner. Genetic testing of asymptomatic siblings should be offered to ensure early detection and treatment. At-risk relatives may also be tested to determine carrier status. Prenatal testing and preimplantation genetic diagnosis may be offered if appropriate. Mock DM. Biotin: From Nutrition to Therapeutics. J Nutr. 2017 Aug. 147 (8):1487-1492. [Medline]. [Full Text]. Hamid M. Said. Biotin: Biochemical, Physiological and Clinical Aspects. Stanger O. Water Soluble Vitamins. Subcellular Biochemistry. 2012. Springer, Dordrecht; 56: 1-19. Zempleni J, Wijeratne SS, Hassan YI. Biotin. Biofactors. 2009 Jan-Feb. 35 (1):36-46. [Medline]. Boas MA. The Effect of Desiccation upon the Nutritive Properties of Egg-white. Biochem J. 1927. 21(3):712-724.1. [Medline]. Zempleni J, Teixeira DC, Kuroishi T, Cordonier EL, Baier S. Biotin requirements for DNA damage prevention. Mutat Res. 2012 May 1. 733(1-2):58-60. [Medline]. [Full Text]. Kuroishi T. Regulation of immunological and inflammatory functions by biotin. Can J Physiol Pharmacol. 2015 Dec. 93 (12):1091-6. [Medline]. Hassan YI, Zempleni J. Epigenetic regulation of chromatin structure and gene function by biotin. J Nutr. 2006 Jul. 136(7):1763-5. [Medline]. Sedel F, Papeix C, Bellanger A, Touitou V, Lebrun-Frenay C, Galanaud D, et al. High doses of biotin in chronic progressive multiple sclerosis: a pilot study. Mult Scler Relat Disord. 2015 Mar. 4 (2):159-69. [Medline]. Tourbah A, Lebrun-Frenay C, Edan G, Clanet M, Papeix C, Vukusic S, et al. MD1003 (high-dose biotin) for the treatment of progressive multiple sclerosis: A randomised, double-blind, placebo-controlled study. Mult Scler. 2016 Nov. 22 (13):1719-1731. [Medline]. Patel DP, Swink SM, Castelo-Soccio L. A Review of the Use of Biotin for Hair Loss. Skin Appendage Disord. 2017 Aug. 3 (3):166-169. [Medline]. [Full Text]. Trüeb RM. Serum Biotin Levels in Women Complaining of Hair Loss. Int J Trichology. 2016 Apr-Jun. 8 (2):73-7. [Medline]. [Full Text]. Adhisivam B, Mahto D, Mahadevan S. Biotin responsive limb weakness. Indian Pediatr. 2007 Mar. 44(3):228-30. [Medline]. Innis SM, Allardyce DB. Possible biotin deficiency in adults receiving long-term total parenteral nutrition. Am J Clin Nutr. 1983 Feb. 37 (2):185-7. [Medline]. Khalidi N, Wesley JR, Thoene JG, Whitehouse WM Jr, Baker WL. Biotin deficiency in a patient with short bowel syndrome during home parenteral nutrition. JPEN J Parenter Enteral Nutr. 1984 May-Jun. 8 (3):311-4. [Medline]. Hayashi H, Tokuriki S, Okuno T, Shigematsu Y, Yasushi A, Matsuyama G, et al. Biotin and carnitine deficiency due to hypoallergenic formula nutrition in infants with milk allergy. Pediatr Int. 2014 Apr. 56(2):286-8. [Medline]. Krause KH, Bonjour JP, Berlit P, Kochen W. Biotin status of epileptics. Ann N Y Acad Sci. 1985. 447:297-313. [Medline]. Hayashi A, Mikami Y, Miyamoto K, Kamada N, Sato T, Mizuno S, et al. Intestinal Dysbiosis and Biotin Deprivation Induce Alopecia through Overgrowth of Lactobacillus murinus in Mice. Cell Rep. 2017 Aug 15. 20 (7):1513-1524. [Medline]. Sealey WM, Teague AM, Stratton SL, Mock DM. Smoking accelerates biotin catabolism in women. Am J Clin Nutr. 2004 Oct. 80 (4):932-5. [Medline]. Pindolia K, Jordan M, Guo C, et al. Development and characterization of a mouse with profound biotinidase deficiency: a biotin-responsive neurocutaneous disorder. Mol Genet Metab. 2011 Feb. 102(2):161-9. [Medline]. [Full Text]. Hernández-Vázquez A, Wolf B, Pindolia K, Ortega-Cuellar D, Hernández-González R, Heredia-Antúnez A, et al. Biotinidase knockout mice show cellular energy deficit and altered carbon metabolism gene expression similar to that of nutritional biotin deprivation: clues for the pathogenesis in the human inherited disorder. Mol Genet Metab. 110(3). 2013 Nov:248-54. [Medline]. Pindolia K, Jordan M, Wolf B. Analysis of mutations causing biotinidase deficiency. Hum Mutat. 2010 Sep. 31(9):983-91. [Medline]. Zempleni J, Hassan YI, Wijeratne SS. Biotin and biotinidase deficiency. Expert Rev Endocrinol Metab. 2008 Nov 1. 3 (6):715-724. [Medline]. [Full Text]. Wolf B. Biotinidase Deficiency. Adam P, et al. Gene Reviews (Internet). Seattle, WA: University of Washington; 2000 Mar 24 ( Updated 2016 Jun 9). [Full Text]. Mardach R, Zempleni J, Wolf B, Cannon MJ, Jennings ML, Cress S, et al. Biotin dependency due to a defect in biotin transport. J Clin Invest. 2002 Jun. 109 (12):1617-23. [Medline]. Neto EC, Schulte J, Rubim R, et al. Newborn screening for biotinidase deficiency in Brazil: biochemical and molecular characterizations. Braz J Med Biol Res. 2004 Mar. 37(3):295-9. [Medline]. Ferreira P, Chan A, Wolf B. Irreversibility of Symptoms with Biotin Therapy in an Adult with Profound Biotinidase Deficiency. JIMD Rep. 2017. 36:117-120. [Medline]. Baykal T, Gokcay G, Gokdemir Y, et al. Asymptomatic adults and older siblings with biotinidase deficiency ascertained by family studies of index cases. J Inherit Metab Dis. 2005. 28(6):903-12. [Medline]. Mock DM. Skin manifestations of biotin deficiency. Semin Dermatol. 1991 Dec. 10 (4):296-302. [Medline]. Komur M, Okuyaz C, Ezgu F, Atici A. A girl with spastic tetraparesis associated with biotinidase deficiency. Eur J Paediatr Neurol. 2011 Nov. 15(6):551-3. [Medline]. Genc GA, Sivri-Kalkanoglu HS, Dursun A, et al. Audiologic findings in children with biotinidase deficiency in Turkey. Int J Pediatr Otorhinolaryngol. 2007 Feb. 71(2):333-9. [Medline]. Chedrawi AK, Ali A, Al Hassnan ZN, Faiyaz-Ul-Haque M, Wolf B. Profound biotinidase deficiency in a child with predominantly spinal cord disease. J Child Neurol. 2008 Sep. 23(9):1043-8. [Medline]. Rathi N, Rathi M. Biotinidase deficiency with hypertonia as unusual feature. Indian Pediatr. 2009 Jan. 46(1):65-7. [Medline]. Joshi SN, Fathalla M, Koul R, Maney MA, Bayoumi R. Biotin responsive seizures and encephalopathy due to biotinidase deficiency. Neurol India. 2010 Mar-Apr. 58(2):323-4. [Medline]. Mikati MA, Zalloua P, Karam P, Habbal MZ, Rahi AC. Novel mutation causing partial biotinidase deficiency in a Syrian boy with infantile spasms and retardation. J Child Neurol. 2006 Nov. 21(11):978-81. [Medline]. Moslinger D, Muhl A, Suormala T, Baumgartner R, Stockler-Ipsiroglu S. Molecular characterisation and neuropsychological outcome of 21 patients with profound biotinidase deficiency detected by newborn screening and family studies. Eur J Pediatr. 2003 Dec. 162 Suppl 1:S46-9. [Medline]. Wolf B. Biotinidase deficiency: "if you have to have an inherited metabolic disease, this is the one to have". Genet Med. 2012 Jun. 14 (6):565-75. [Medline]. [Full Text]. Bandaralage SP, Farnaghi S, Dulhunty JM, Kothari A. Antenatal and postnatal radiologic diagnosis of holocarboxylase synthetase deficiency: a systematic review. Pediatr Radiol. 2016 Mar. 46 (3):357-64. [Medline]. Weber P, Scholl S, Baumgartner ER. Outcome in patients with profound biotinidase deficiency: relevance of newborn screening. Dev Med Child Neurol. 2004 Jul. 46(7):481-4. [Medline]. Welling DB. Long-term follow-up of hearing loss in biotinidase deficiency. J Child Neurol. 2007 Aug. 22(8):1055. [Medline]. Wolf B. Disorders of biotin metabolism. Scriver CR, Beaudet AL, et al, eds. The Metabolic and Molecular Bases of Inherited Disease. 8th ed. New York, NY: McGraw-Hill; 2001. 3935-62. Wolf B. Biotinidase deficiency and our champagne legacy. Gene. 2016 Sep 10. 589 (2):142-50. [Medline]. Laszlo A, Schuler EA, Sallay E, et al. Neonatal screening for biotinidase deficiency in Hungary: clinical, biochemical and molecular studies. J Inherit Metab Dis. 2003. 26(7):693-8. [Medline]. Yetgin S, Aytac S, Kalkanoglu S, Coskun T, Ortmann C, Kratz C, et al. Biotinidase deficiency and juvenile myelomonocytic leukemia in a Turkish infant of consanguineous parents. Pediatr Hematol Oncol. 2007 Sep. 24(6):453-5. [Medline]. Suormala T, Wick H, Baumgartner ER. Low biotinidase activity in plasma of some preterm infants: possible source of false-positive screening results. Eur J Pediatr. 1988 Jun. 147 (5):478-80. [Medline]. Schulpis KH, Gavrili S, Tjamouranis J, Karikas GA, Kapiki A, Costalos C. The effect of neonatal jaundice on biotinidase activity. Early Hum Dev. 2003 May. 72 (1):15-24. [Medline]. Pindolia K, Jordan M, Wolf B. Analysis of mutations causing biotinidase deficiency. Hum Mutat. 2010 Jun 15. [Medline]. Dobrowolski SF, Angeletti J, Banas RA, Naylor EW. Real time PCR assays to detect common mutations in the biotinidase gene and application of mutational analysis to newborn screening for biotinidase deficiency. Mol Genet Metab. 2003 Feb. 78(2):100-7. [Medline]. Bunch M, Singh A. Peculiar neuroimaging and electrophysiological findings in a patient with biotinidasedeficiency. Jan 2011. 1:83-86. [Medline]. Desai S, Ganesan K, Hegde A. Biotinidase deficiency: a reversible metabolic encephalopathy. Neuroimaging and MR spectroscopic findings in a series of four patients. Pediatr Radiol. 2008 Aug. 38(8):848-56. [Medline]. Biotin is a bicyclic (more precisely, heterocyclic) compound composed of an ureido ring (A) fused with a tetrahydrothiophene ring (B). A valeric acid substituent is attached to one of the carbon atoms of the tetrahydrothiophene ring. Carboxybiotin carboxylase is the activated form of a carboxylase that conducts the actual carboxylation of a substrate. The CO2 residue attached to the nitrogen atom diagonally across from the valeric acid substituent is transferred to the substrate to be carboxylated, and the original carboxylase is liberated intact. Biocytin is the product of the complete proteolysis of biotin-containing proteins and peptides. The enzyme biotinidase cleaves biocytin into free biotin and the amino acid lysine. The free biotin is then available for intestinal absorption or intracellular coupling to an apocarboxylase to form a holocarboxylase. The authors and editors of Medscape Reference gratefully acknowledge the contributions of previous author, Howard R Sloan, MD, PhD†, to the development and writing of this article.